In addition to starting the new year with a frigid swim, I also planted my first round of seeds on January 1st. Here we are, 20 days later, and I have seedlings to show for my effort. 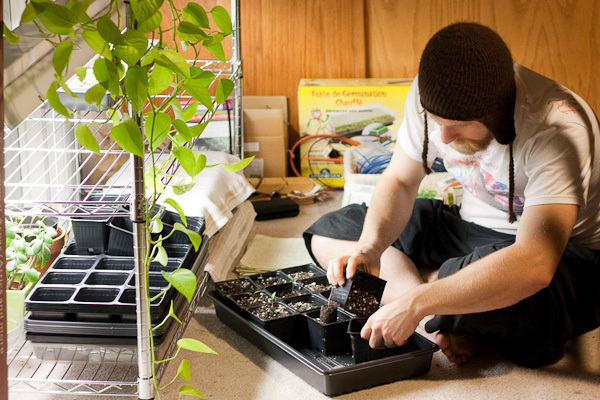 I am transplanting some of my seedlings to larger containers. Because I am trying to increase our yields this year and the garden is doubling in size, I invested in a number of supplies to help establish stronger seedlings indoors for transplanting. To aid in Germination, I purchased a heated mat which sits beneath the nursery tray and heats the soil about 10 degrees above room temperature. 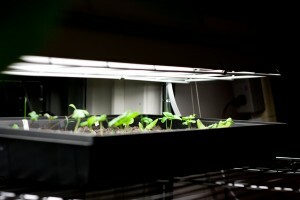 After the plant has sprouted, it does not need the warmer temperatures provided by the heat mat, so it can continue growing without the supplemental heat. To make my transplantings go more smoothly this year, I purchased a large number of 4″ square plastic pots and standard nursery trays. I will transplant my seedlings from the germination trays to these larger pots as they get too large for the starter trays. To keep the plants from becoming spindly in their search for adequate sunlight, I invested in supplemental lighting. I chose generic 4′ Fluorescent fixtures from Home Depot designed to hang from a chain. I selected a fixture which uses the newer and thinner “T8” bulbs as they are more energy efficient. I did not buy specialty “grow bulbs”, as my cursory research online indicated that they weren’t significantly better, while almost 10 times as expensive. As they are on a chain, I can adjust the light so it nearly touches the leaves of the seedlings. From my investigations, it appears that seedlings need to be within 2-3 inches of the flourescent bulb to get adequate lighting and grow a thick, healthy stem. To suspend the light fixtures and organize the plants, I purchased a Stainless Steel Wire Rack shelving unit. It is 18 inches deep and 4 feet wide. 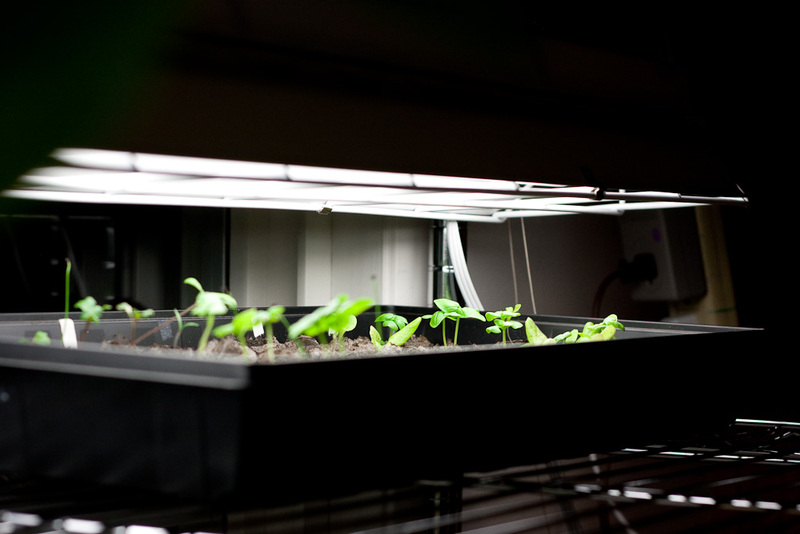 This allows 4 standard seedling flats per shelf, and easily accommodates the 4′ fluorescent fixtures. 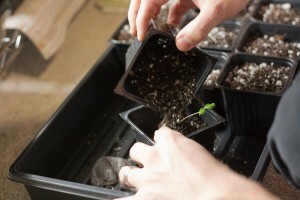 I will use this approach to raise many of the plants commonly started indoors like Tomatoes and Peppers. They will grow indoors for months under supplemental light before they are ready to go outside. The tomato plants I started earliest may need to be transplanted multiple times, from their 1″ starting pod, to a 4″ pot, and may need a 1/2 gallon pot before transplanting it outdoors. I am also starting onions, leeks, green onions, shallots, carrots, cabbages, spinach and lettuces indoors to give them a head start. I am planning to get them established indoors, then move them to the garden in late February under the protection of one of my three mini-greenhouses which fit over a square foot bed. As the varieties I selected are all pretty hardy, I should be able to remove the protection provided by the Greenhouse after the last hard frost which is probably in April.